How is your body feeling??? That’s why Dr. Cohen created the Computer Survival Kit. 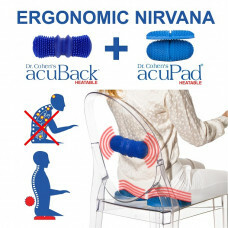 Place the acuBack behind your spine and one acuPad under each buttock – notice how you are now sitting up straight with zero effort? Your neck, upper back, lower back and shoulders are all properly aligned and all you have to do is sit! Enhances the value of any professional care you receive & reduces need for treatment saving you time, money and pain. a big difference in the way you feel at the end of the day and helps to improve productivity. of any professional care you receive making you need less treatment overall. 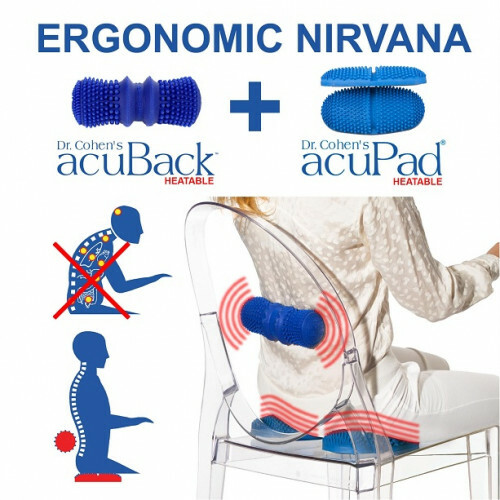 Includes Dr. Cohen’s 7 Essentials of Healthy Computing, a link to Dr. Cohen’s specially designed stretches for Computer Users plus the HEATABLE acuBack and acuPads (set of 2). Educate your children on proper computer posture as well by giving them the tools to sit straight and feel great!